NOTE: This I-Candy Post contains NO bikini or underwear shots. This post is 99% Modest! Once again we delve into the world of Idol imagery, but who shall we go on a date with today...? 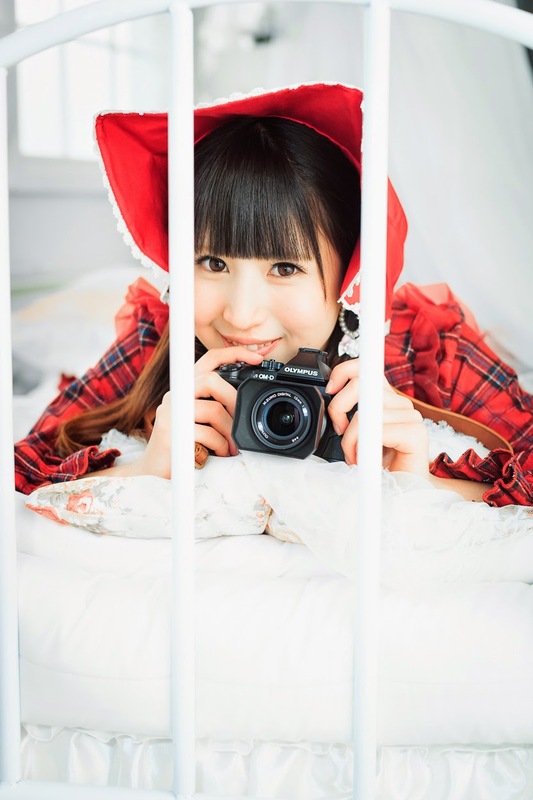 Through the random threads that we call Fate, I somehow stumbled across the delight that is Tani Mayuri, a model who has only recently debuted as an Idol with her digital single release, EDEN. At 18 years old, Mayuri is a sweet-faced beauty who has modelled for the likes of POPTEEN and various websites, and is signed to the company RR Promotion. When the first thing you see in the morning is Mayuri Tani, your cute next door neighbour, as you walk to school together, wouldn't your heart beat just a little faster...? Ah, being together just makes your school days feel even better, right!? For you though, she will only ever show this kind of smile. Doesn't that make you feel just a little bit happy...? Ahhh, she's so cute! I bet every guy in school is jealous of you for having such a cute, sweet-faced girlfriend like Mayuri! When the school day ends though, it's time to relax and head to the beach! Seeing Mayuri in cute summer clothes, it's far too much for you to handle! Kyaaaa! H-Hey! Don't splash the water! You'll get your clothes wet!!! Hey, do you want to build a Sand-Man...? Going on dates with Mayuri, they're the best, right!? For some reason though, Mayuri still prefers her school uniform, doesn't she? Why do you look so confused with those leaves? They're just Autumn leaves!!! Well, Mayuri's really cute, no matter what! What, you want helping up? But you're the one who decided to sit there! Ah, now she's in Cosplay... how can one girl show this many cute sides to her in one date!? Ah, that was a long date! Now it's time for the two of you to rest a bit! Oh, what a kind smile. Did you have fun today, Mayuri? But this shy side of Mayuri's, you really like that about her too, don't you? Because for you, Mayuri is the sweetest! Hm, what does Mayuri want to do next with you...? Flowers!? Mayuri truly is a considerate girl, isn't she? When you pull those faces though, Mayuri, you really take away everyone's hearts!!! Ah, if it's Mayuri handing you the pieces of fruit, you'll surely begin to eat healthily from then on! Hey, Mayuri, you know that you look like a bride, right...? Well, how about you finish off with some reading? A good book is always the way to end a fulfilling day, won't you agree? A sweet and innocent post filled with Gravure, this has been our little Date with the cute and gentle looking Mayuri Tani! Though I still don't know much about her, I already find this girl quite endearing just from watching her debut PV, as well as looking at her pictures that you can easily find online. Honestly though, this girl is certainly intriguing, and extremely cute to boot. I look forward to her future activities as a soloist, and hope that she goes further than the one digital single she has recently released. It would be a shame to see her finish off her Idol activities so quickly. Until next time, and have a Happy Idol Date!